Worcester Warriors boss Dean Ryan has reminded his players that one win does not make a season after finally earning his long-awaited first victory as boss. After putting behind them this season's previous first-half flops to register three tries by the break, Worcester made hard work of seeing out their 21-16 LV= Cup win over Cardiff Blues. "It was never going to be a thing of beauty," Ryan said. "But let's not pretend we've solved everything in one night." Worcester's 21-16 LV= Cup win in Wales was their first victory in 10 matches in all competitions this season - ending a winless run going back to St David's Day (1 March). 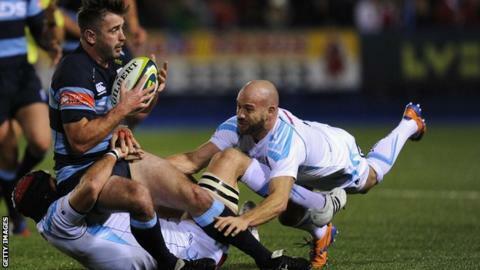 Ryan's Worcester remain rooted to the bottom of the Premiership, having lost all of their first seven matches in the league. Tying in the five straight league defeats with which they ended last season, Worcester's latest league defeat, 21-6 at home to Bath, means that their current losing run is now the Premiership's worst in almost 15 years, since Bedford also suffered 12 straight losses between October 1998 and January 1999. And, if they were to lose again when they return to league action at Sale on Friday, 22 November, a 13th straight defeat would mean that only two sides in the 18-year history of the Premiership have suffered worst runs. But, even against a thinned-out Blues side, who had supplied 20 players to international duty, Ryan is concerned only with the confidence boost of a much-needed victory to take into this Friday's second LV= Cup group clash against Leicester Tigers. "It was always likely to be a bit ugly," he told BBC Hereford & Worcester. "But to come away from home and get a result is a nice lift. "We've got some confidence, sorted some of our issues, we've got a win and we've got some of our young lads playing. "Competitive sportsmen want to win. They worked really hard all week, as have the coaching staff, who have been fantastic. "It would have been nice if we'd smashed on and got a bonus point, but that's not where we are as a side."